New car registrations grew rapidly for five years from 2012, but fell by 5.7% in 2017. The weakness was evident across both private and business & fleet registrations (chart 1). Both spiked ahead of tax changes in April and then fell sharply. Registrations have remained weak since, hovering around levels last seen around five years ago. The persistent lack of a recovery in new car sales over the course of 2017 has motivated a range of potential explanations. We explore two of these: (1) tax and regulation; and (2) fundamental drivers of demand. The fall in new car registrations in 2017 Q2 was initially attributed to changes to Vehicle Excise Duty (VED), which came into effect in April 2017. The measures affected only cars first registered from 1 April 2017 onwards, introducing new charges according to a vehicle’s CO2 emissions. Given that the VED change was announced in advance, sales picked up prior to its implementation. Registrations then fell from 2017 Q2 onwards, but to a much larger degree than a simple reversal of the prior increase would suggest. There are three possible ways in which households could have adjusted their consumption in response to higher tax: (1) switching from more expensive cars into cheaper alternatives; (2) substituting away from higher emission cars and towards those with cleaner engine types that are penalised less (or not at all) under the new regime; and (3) opting for second-hand cars, or holding on to their existing cars for longer – again to avoid the charge. The first possible effect – favouring cheaper cars – should by itself mean little change in the trend in registrations, since industry data from the Society of Motor Manufacturers and Traders (SMMT) simply measure the total number of vehicles registered. But as we’ve seen car registrations actually fell sharply in 2017. The second response would be consistent with softer demand for higher emission cars; and indeed, diesel car registrations were down 17.1% in 2017. The car industry has argued that the weakness in registrations at the end of 2017 followed months of confusion and speculation about the Government’s air quality plans and its policies towards diesel cars. Some clarity was provided in the November 2017 Budget, where higher charges were announced for new diesel cars that are first registered from 1 April 2018. 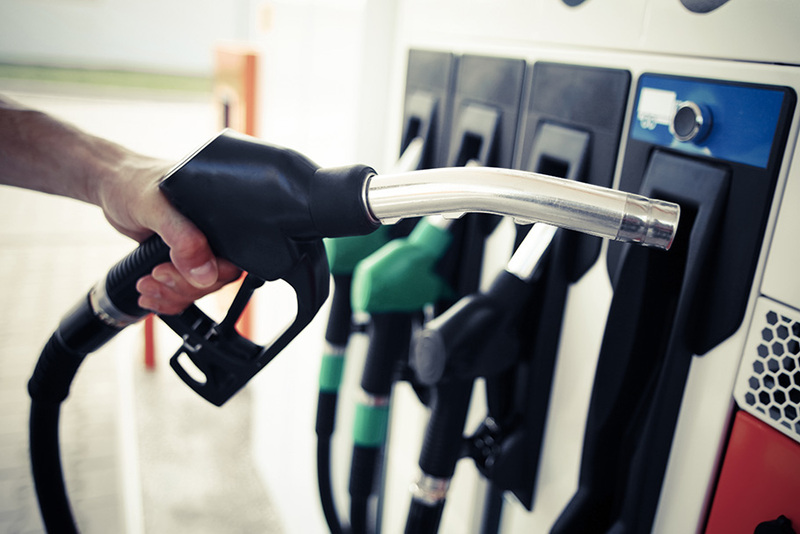 The evidence suggests that some substitution into other fuel types did take place in 2017: in contrast with the large fall in diesel, petrol registrations increased by 2.7%. But that growth did not represent an acceleration relative to recent years, despite the tax changes making petrol vehicles relatively more attractive. This hints at some other factors weighing on overall demand for cars. Similarly, there is only limited evidence of the third possible response – substitution into used cars (chart 2). Because these cars are not subject to the new VED regime, the softening in the used car market reinforces the hypothesis that weakness in the car market is not primarily due to tax changes. And, although the average age of vehicles has been rising, this trend pre-dates tax changes, so isn’t obviously consistent with this being a response to tax changes in this instance. 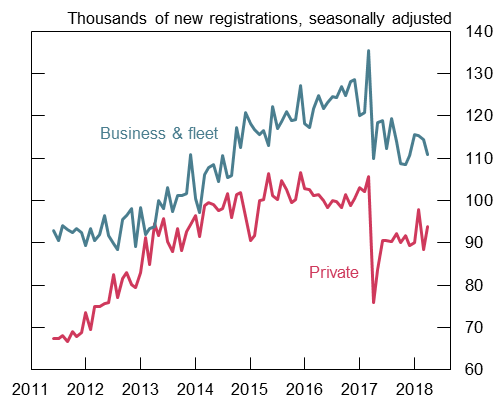 Car registrations grew particularly strongly over 2013-16, raising the question of whether some part of the current slowdown can simply be attributed to market saturation. The number of cars per 100 households rose from 85 in 1996 to around 105 in 2017, as the inflow of new cars into the stock (adjusted for scrappage) outpaced growth in household population. To investigate whether that and other fundamentals had played a role in the 2017 slowing of the car market, we estimated a simple error-correction model in which vehicle consumption (as measured in the National Accounts) is a function of real household disposable income per capita, real oil prices (as those affect fuel prices, and hence the cost of running a car), and consumer confidence about making major purchases. An error-correction model is a time series model relating the movement of the variables in any period to the previous period’s deviation from an estimated long-run equilibrium; but although variables tend to converge to that equilibrium, short-run factors can drive them apart. Our model suggests that, even though all three of these factors supported strong growth in new car sales from 2013-16, the actual level of sales grew even faster. The extent to which changes in motor dealer finance – in particular the rapid growth of the use of Personal Contract Purchases (PCPs) to buy cars – may have stimulated demand during this period was analysed by our colleagues last year. There may also have been some catch-up growth from pent-up demand as new car sales were well below their equilibrium level over 2010-13. Our calculations suggest that sales returned to their equilibrium level in 2017 (chart 3). 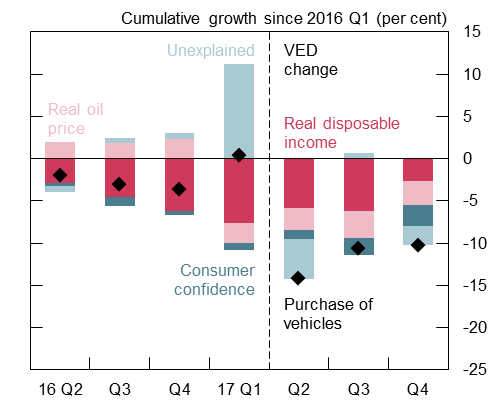 Applying this model to the recent data suggests that the decline in vehicle consumption over the past year can be largely explained by weak fundamentals, in particular by real income developments (chart 4). The unexplained pickup in 2017 Q1, followed by unexplained weakness in Q2, appears consistent with a forestalling effect ahead of the VED changes. But beyond some reallocation of consumption across those two quarters, the model suggests that tax changes played only a modest role in explaining the broader weakness over 2017. We have also used the described framework to project the consumption of cars out through 2018. With car sales now broadly in line with the equilibrium level suggested by fundamentals, and with real incomes forecast to grow at a subdued pace, the model suggests spending on cars is likely to remain weak in coming quarters, notwithstanding the volatility in new car registrations we’ve seen at the start of this year. Although tax changes may have played some role, we think that the recent decline in new car sales has largely reflected weakness in fundamental factors – real disposable income in particular. But our estimates also suggest that car sales had been running ahead of their long-run equilibrium between 2013-16, perhaps as new cars became more affordable as a result of the shift in the way purchases are financed. 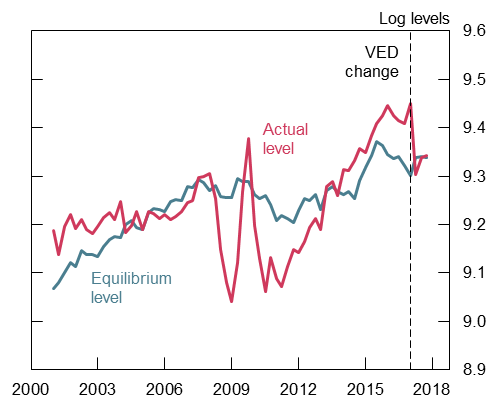 That could have exacerbated the downward adjustment in demand last year, as suggested by our finding that demand has fallen back to its long-run equilibrium level. While the weakness of private vehicle registrations weighed on overall household consumption in 2017, more recent data suggest that car sales are no longer dragging on growth. 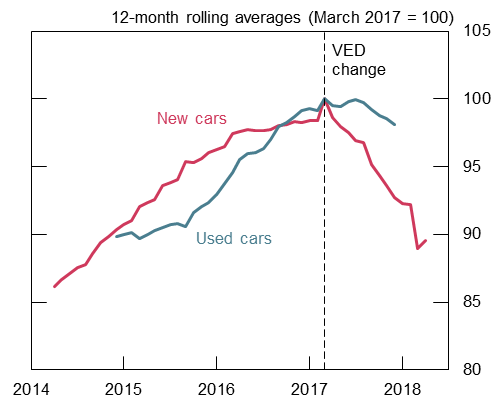 And given that the weakness in car sales appears to partly reflect the market returning to equilibrium, subdued car sales don’t necessarily mean we should also expect total consumption to be weak. So even if the demand for cars has less gas in the tank, the consumption engine remains intact. Simon Kirby, Andre Moreira and Michal Stelmach work in the Bank’s Monetary Analysis Division. Previous Post Algos all go? Next Post US Hurricane Clustering: A New Reality? Really interesting-thanks for posting! I agree, when you graph deseasonalised regs and regular pay real wage growth, they aren’t exactly correlated but the means do rise and fall together. However, there does seem to be some hope because they are currently both trending upwards. Also fleet regs were flat in April form a low base, suggesting that car brands did not see the need to push any extra volume onto the market, given that retail was recovering nicely from the VED distortion last year. Also there is anecdotal evidence that car brands have reduced incentive spend for Q2 suggesting that Q1 was stronger than expected.